Eisspeedway Journal: FINAL LINE UP DECIDED(RESULT AND START LIST FINAL)!! FINAL LINE UP DECIDED(RESULT AND START LIST FINAL)!! 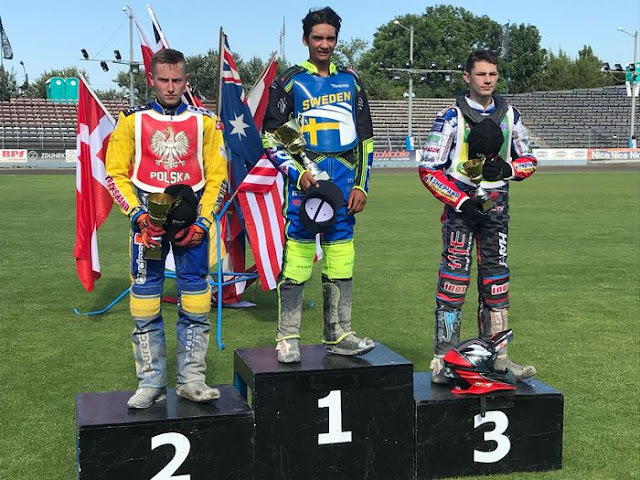 The two semi-finals of the Youth World Championship took place in Gdansk on Wednesday with the top seven from each event qualifying for Friday’s Final in Torun. In very hot weather but on a well-prepared track it was Sweden’s Philip Hellström-Bängs who took the top position in the first event with Mateusz Bartkowiak of Poland in second place after a run off with Australian Jacob Hook. Norway’s Espen Sola finished in fourth place missing one race when he failed to make the two-minute time allowance. German Lukas Wegner also had a disappointing meeting, losing a chain whilst leading in his first race then looping at the start of Heat 15. Esben Hjerrild of Denmark topped the second Semi Final with a 15 point maximum with the Pole Karol Zupinski winning the run off for second place over Aussie Keynon Rew. Czech Filip Šifalda was taken to hospital after a crash in Heat 3 and took no further part in the meeting. There will be nine nations represented in Torun. Australia, Poland and Denmark lead the way with three each, Sweden, Germany and Great Britain with two and Finland with Norway and Estonia providing one each. What a nice mix of Nations with some of them back to the sport after a long time out of the scene like Estonia. It may have been 4th July but there was little to celebrate in the USA camp with both Sebastian Palmese and Colton Hicks finishing in the bottom half of their rounds. However they will surely benefit from their experience of a European track so different from those in their native California. BLÖDORN LIFTS THE TROPHY -RESULTS! FINAL FLOURISH FOR WOFFY IN CARDIFF? LJUNG SET FOR SCANDINAVIAN SGP! SGP ACADEMY RETURNS TO CARDIFF! ANOTHER GOLD FOR THE FRENCH - OFFICIAL RESULTS! YOUTH PROGRAMME: YOUTH TO THE FRONT!